Among youth aged 15-19, the prevalence estimate for ever trying e-cigarettes was comparable to cigarettes or cigarillos, but higher than other smoked tobacco products (see Figure 10.1). Among youth aged 15-19, past 30-day use of e-cigarettes was less prevalent than cigarette smoking, which was reported by 9.8%a. 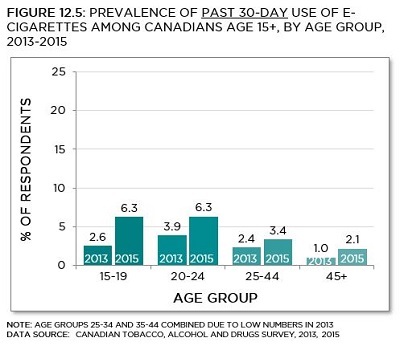 Of those who reported ever trying an e-cigarette, use in the past 30 days did not vary significantly by age group:128 24.5%b of ever-users aged 15-19 had used an e-cigarette in the past 30 days, as well as 20.8%c aged 20-24, 23.2%d aged 25-44, and 27.4%e aged 45 and older. 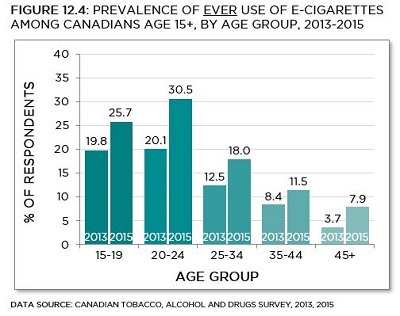 Data source: Canadian Tobacco, Alcohol and Drugs Survey, 2031, 2015. Of those reporting e-cigarette use in the past 30 days, the proportion using daily increased significantly with age,130 from 21.0%i of users aged 15-24, to 32.5%j of users aged 25-44, to 42.8%k of users aged 45 and older.